Coming up with content for social media can be frustrating, exhausting, and time consuming. Having a social media marketing calendar that you can easily reference when you feel stuck can be really helpful. There are so many great ones out there, a simple search for “social media marketing posts” results in dozens of great ideas. 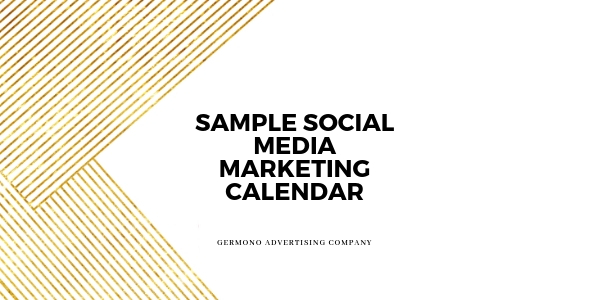 We created the sample calendar for you. It provides ideas to brainstorm when tailoring your posts, but remember- post items that your audience will find interesting and engaging and always check your insights to adapt to what your followers like. If you’re just starting out, we recommend starting off by posting 6 times a week on Facebook, LinkedIn, Twitter and Instagram. Remember to tailor each post for each platform! 3 posts per week should be related to your industry. Position yourself as the expert in your industry. Share helpful tips and advice with your followers. For example, we are an advertising agency that specializes in media planning, buying and management services; as well as, social media marketing, so every Monday, we post a free marketing tip. We want our followers to be able to take that and easily apply it to their business. Next, 2 posts per week should be directly related to your company. We like to focus on how our clients inspire us and what our team is up to. You want to humanize your company in social media. Who cares about your sale if they don’t know WHY they should shop at your location? Company-related posts include explanations of why your company gives back to the community, explaining the importance of a recent award your company received, a new hire coming on board and posts that celebrate clients/customers. Your 6th post should have a call to action. For Facebook, try using a soft call to action so the user doesn’t feel as if you are trying to sell them something. Let’s face it, we don’t like to be sold to! We’ll post testimonials and share out information about our services, encouraging folks to contact us if they have any questions with their advertising and marketing. We also like to post fun giveaways. Happy social media’ing (we aren’t sure if that’s a word, but hey…you get our drift). Any questions? Reach out and let us know how we can help. We offer free 30 minute initial consultations. YAY!